If you're wondering how to measure stair treads, you've come to the right place. Measuring stair treads is just as simple, fast and easy as installing them. It's a straightforward DIY job that anyone can do. And when it comes to a stair tread measure tool, you don't need much. A retractable tape measure is handy, but if you don't own one, a cloth measuring tape or even a wooden or plastic ruler will do. 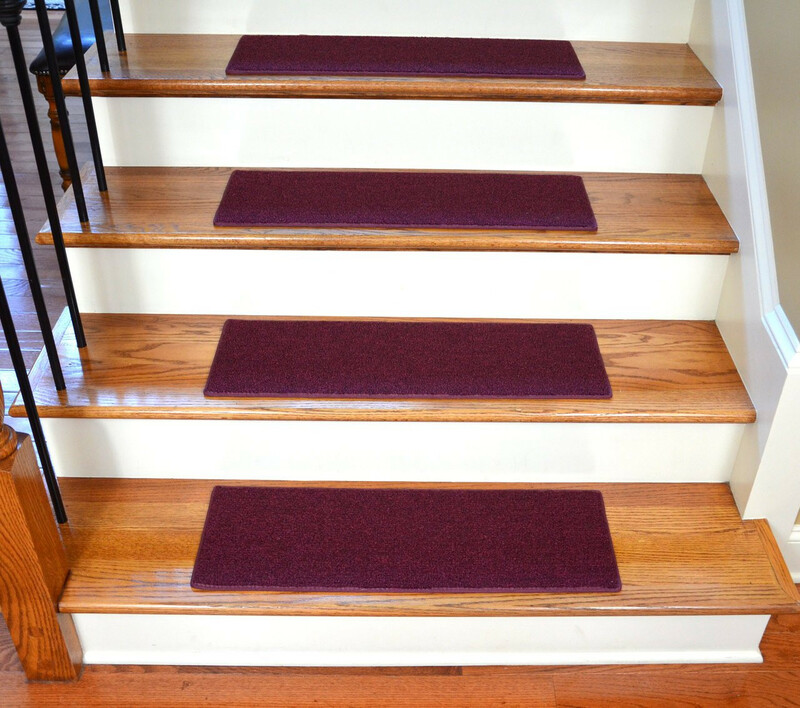 Most people want to install their stair treads with a little bit of space on each side to show off the hardwood or carpet underneath - that is, on the right, the left, the top and the bottom. Usually, if you choose to go this route, it's fine to leave at least a couple of inches on each end and an inch or two at the top and the bottom, although many people like to leave about 6 inches. Decide how much of the stair step that you want to cover. Say you want a 2-inch border. If you have a step that's 36 inches wide and 12 inches deep, to center your stair tread, you'd measure 2 inches on the right and the left side and 2 inches on the top and the bottom. Making a small pencil mark where you measure will help ensure that you place the stair tread in exactly the right place so you get it perfectly centered. Of course, there's no accounting for taste, and you may wish not to have your stair treads perfectly centered, or you may prefer to cover your entire step with a stair tread. In that case, adjust your measurements accordingly. The measurement also depends on the size of the stair treads you are using. At Dean Flooring Company, we carry a wide variety of sizes of stair tread. The standard depth is 9 inches, although we stock stair treads 8 inches and below as well as stair treads 10 inches and up. As for width, we offer an even bigger selection of choices. We have stair treads 24 inches wide and smaller as well as stair treads 36 inches and larger. Common widths available include 25 inches, 30 inches, 31 inches and more. Do you have an unusual measurement in mind? No worries. Our standard sizes include fractional width increments such as 26.25 inches. If that doesn't cover it, we also offer custom sizes cut precisely to your order. We manufacture many of the carpet treads that we sell, so we can accommodate just about anything you have in mind. Meanwhile, you get the peace of mind of knowing that you're buying a quality stair tread made in the U.S. with old-fashioned American quality and value. Another thing to consider when measuring your stair treads is shape. Most people will opt for standard rectangular stair treads. After all, these mirror the normal shape of most staircase steps. When you install rectangular stair treads on rectangular steps, the resulting parallel, clean lines are pleasing to the eye. But at Dean Flooring Company, we have other shapes available. Our hexagon-shaped stair treads, for instance, give your steps an attractive, directional look and an eye-catching design. 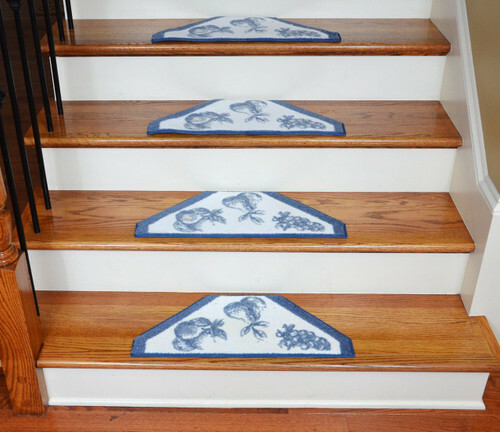 These six-sided stair treads can yield especially pleasing results when combined with floral and other vibrant, attractive patterns. In fact, if you have some other shape in mind, please give us a call. Just dial our toll-free phone number or send us an email and our team of experts will help you come up with a custom shape and size that fits your staircase and design scheme like a custom-tailored suit. One more factor to keep in mind for stair tread measurement is pile depth. At DeansStairTreads.com, we offer stair treads in three basic pile depths: lower pile height/thickness; medium pile height/thickness; and higher pile height/thickness. Which type of pile height and thickness you choose depends largely on your personal tastes and your living or office environment. Lower pile height and thickness might be most appropriate for warmer climates and for staircases that get lots of use by pets and children, while high pile heights and thickness are often a good choice for cooler climates and more sedate users. Medium pile, of course, is a good compromise and a choice for all seasons. After you have measured your stair treads, be sure also to count your steps so you will know how many stair treads you need to install. Our standard sets typically come with 13 stair treads, but in most cases we can break a set to give you fewer than 13, if you don't need so many. We can sell most of our stair treads by the piece, although in a few cases we can't break sets. Dean Flooring Company can also usually provide more than 13 stair treads upon request. Since we're a major retailer of stair treads and also manufacture all our stair treads right here in the U.S., we can meet just about any request you may have in mind. Give us a toll-free call or email us for specific stair treads you have in mind and let us know exactly how many you need to do the job. Feel free also to call us if you have any general questions about measuring stair treads. 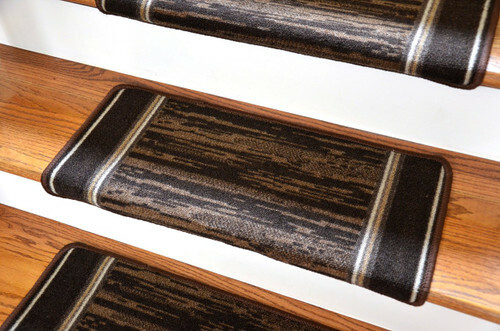 At Dean Flooring Company, we're stair tread experts, and we're happy to share our knowledge.